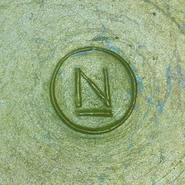 Did you know that Carnival Glass marked with an N was once believed to be a Napoleon mark, found on glass made in France? And others suggested it actually stood for Nancy Glass (which is also French). 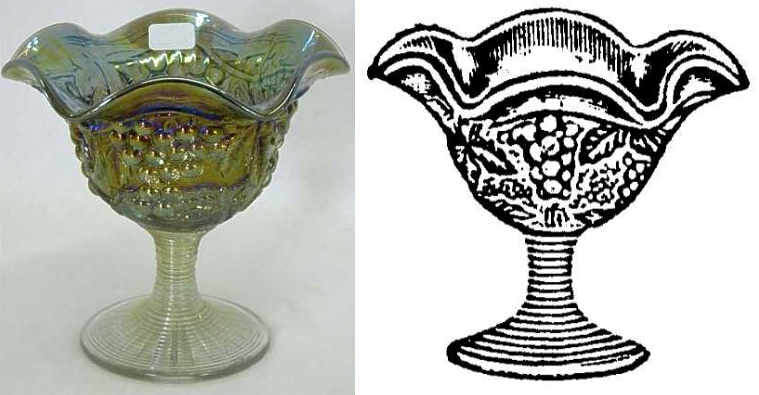 We got to considering how much Classic (old) Carnival Glass was marked in such a way, and what those marks might tell us. ​​Of course we now know that the 'N' (above) was the mark that Harry Northwood famously used on some (but not all) of his Carnival. Northwood was clearly very proud of his Acorn Burrs design - the pieces shown on the right all have his underlined "N" in a circle mark. It’s easy to understand the difficulties back then, when Carnival was just starting to emerge as a collectable, and little was known about it. In fact author Larry Freeman, writing in his 1956 book “Iridescent Glass”, said that “a common error is the attribution of all heavy pressed iridised glass to Nancy” (that’s Daum-Nancy in France). Fast forward to today. We are all so much better informed, with decades of intensive research and the wealth of information on the internet, and yet the ability to surprise is still present. What you see here on the right is a mark with a difference. It’s a Registered Design (RD) mark moulded onto the lid of a butter dish. The mark is hard to capture, but it reads - R.D. No. 494747. Here’s the backstory … the pattern is called Meydam, and it was made by Leerdam of the Netherlands. This is the very first RD number we have seen on a piece of glass made by Leerdam. ​And here’s the curious and fascinating bit … the design was actually registered in Britain in 1907 by an agent called Guggenheim, acting on behalf of the Leerdam glassworks. The pattern was shown in Leerdam’s catalogues from 1906 (shown, right), although it probably would not have been made in Carnival at that time. However, the discovery of a piece of Carnival from Leerdam with an old RD number on it is significant. It raises doubt on previous theories that Carnival was not made by Leerdam until the 1930s. Left: a Meydam covered butter in marigold. ​Sincere thanks to Barbara Harriman for her photos of this fascinating piece of glass. Carnival made by Crown Crystal is well known for having characteristic Registered Design Numbers on some patterns. The reason was no doubt to give some sort of protection to the designs and stop others from copying. Early designs such as the Kingfisher, Kangaroo and Swan, can all be found with moulded RD numbers within the main pattern. These were lodged as Registered Designs and by law they were obliged to have that number actually “stamped, engraved or impressed on the design of the article”. That’s why the RD number had to be there … it was the law! Above: a Kingfisher bowl in "dark" (purple) marked "RD 4184"
So why didn’t all the other Australian patterns such as the Emu (the small sauce in shown here in marigold), the Shrike, Butterfly Bush and so on, also have to have a number shown? The answer is that Crown Crystal changed their tactics! Instead of registering the actual designs, they registered them as trademarks instead. It was a smart and clever move that allowed them to do away with the obtrusive number within the pattern, but better still, it gave them longer protection against copying with much stiffer penalties for any transgressors. ​This beautiful little marigold vase stands 5½” high and has a rather “Art Deco” feel to it, suggesting it was designed c. the mid to late 1920s. ​The iridescence has a shimmering look, alternately showing lime, turquoise and shades of pink. ​​​What’s in a Name? Comport or Compote? Right: Imperial Grape in smoke (courtesy Seeck Auctions) and an extract from a 1915 Butler Brothers catalogue which described it as "ftd. comport"
A fascinating and lively discussion recently took place in our NetworK Facebook Group about the use of the terms “comport” and “compote”. We’ve summarised the conclusions in this feature: Comport or Compote … that is the question. In NetworK #35 we showed you a Fenton ad for their Contemporary "Cobalt Marigold" Carnival, introduced in 1984. Here is another new 1980s colour from Fenton: their Teal Marigold Carnival, which they introduced in 1989 with the colour product code "OI". The catalogue page is courtesy of the late Frank Fenton who gave us much original material when we were researching in the Fenton archives at Williamstown. Yes, there is a connection between this magazine header on the right (the header of a magazine which had a very obvious target audience! ), and Late / Depression Era Carnival Glass. Here's a clue: Don't bark up the wrong tree! The answer and the full ad, and others are to be found in our unique Read All About It series, here: "The Farmer's Wife"
We talked about Northwood's famous 'N' mark at the top of this issue. Collectors need to be aware that such is the "cachet" attached to it, that the 'N' mark has been faked. As with all fakes, it was done in order to deceive unwary buyers. We know that we have many readers who are relatively new to the world of Carnival Glass (and you are all very welcome), so we thought it would be a good idea to point you towards our website articles about fakes. ​Here is the link to the main page, and there are further links for additional reading: Fake Carnival Glass.